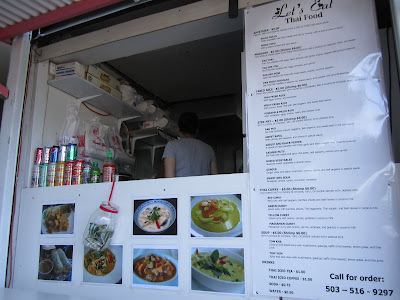 South Waterfront blog: New cart: Let's Eat Thai Food! 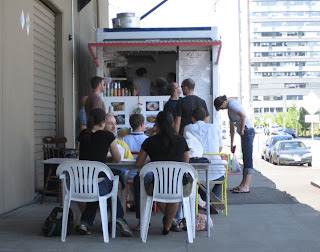 This week my Food Cart Monday post was pre-empted by all the "Grimm" excitement. So for this week, it is Food Cart Tuesday - and the lucky cart is... "Let's Eat Thai Food"! 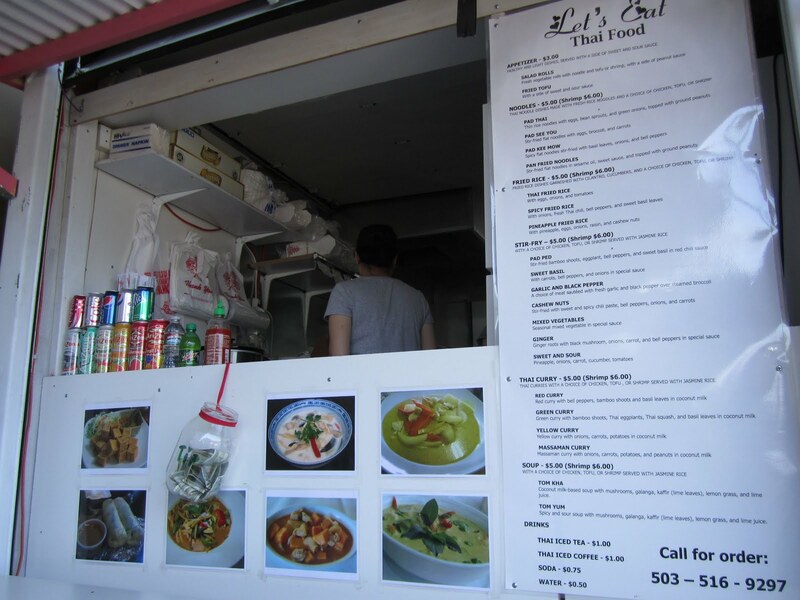 Let's Eat Thai Food is located at the north end of what we are now calling Food Cart Row in the South Waterfront, including the 4 carts* parked along Moody Ave. This is the first food cart venture for owner/founder "Venus". She started the cart business up a few months ago and is working together with her parents. Her mom is doing the cooking and to give you a hint of what you are in for...she is using HER OWN FAMILY RECIPES. Venus said that their standard noodle dishes, Pad Thai & Pad Kee Mow, are popular, as well as Green Curry & Yellow Curry on the rice dish side of the house. 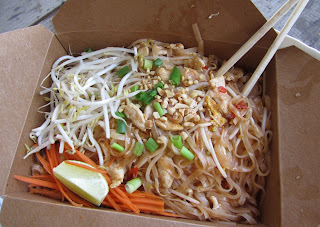 I chose to go with the Pad Thai for lunch (medium spice). Three words to describe it? 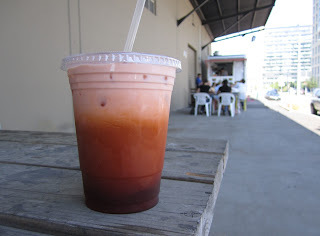 We also ordered the Thai Tea, upon recommendation from a friend. It faintly reminded me of an orange creamsicle, in a good way. Definitely $1 worth of wonderful-ness there. A crowd of people were eating & waiting for orders, including a few regular customers (already). Venus said that while business was a little slow starting, it is now picking up. They are also getting some 100% straight positive reviews on Yelp. These are all good signs! By the way, Let's Eat Thai Food is the only one of our food carts open through dinner, and some on the weekends. So, it is a good option if you are looking for somewhere to stop by on your walk, bike, or drive home from work. I continue to be surprised and impressed by what I'm finding on Food Cart Row. This is a new favorite spot of mine. Just biked over for lunch today with a coworker from OPB and saw two folks there from OHSU. Great cheap lunch break on these sunny fall days. I had the eggplant special, which was excellent with a huge portion, nice big hunks of eggplant and good spice kick. Thanks so much for your comment. I genuinely love this place too. It's great to hear that folks from OPB are biking over for lunch!